Summary Graphs contain a number of graphs that display the consolidated information on all user profiles of the current test scenario. You can view Summary Graphs on test completion to know how tests were performed. You can also view intermediate results at run-time while your test is being executed. You can manually choose what graphs will be shown on the chart. Check/uncheck options below the chart to show/hide graphs. You can check the All option to display all graphs on this tab. : The number of active users is displayed on the right side of the chart. : The number of pages executed per second is displayed on the left side of the chart. If you place the mouse cursor over a graph node, the value in the current node will pop up. If you cannot see the whole graph at once, you can drag it with the mouse to view all its parts. You can increase/decrease the scale of any axis on the chart. Place the mouse cursor over axis values and drag them to get a desired scale. You can use the Autofit chart option to scale the graph down to window size. Double-clicking on the chart will have the same result. If there are too many nodes displayed on the chart and neighbour nodes merge together, you can resample the graph with the Resample arrow. Avg response time: Shows values of response time averaged through all user profiles. This is response time for main page requests (without page resources). Average response time is one of the most important characteristics of load testing; it measures web user experience. Response time graph will tell you how long a user waits for server response to his request. 1. Flat (or very slight growth): It is an ideal result. The increase of load on the server does not lead to the increase of response time (or leads to very slight growth). 2. Gradual growth (essential growth): The increase of load on the server leads to gradual growth of response time. It means that the server can handle the growing level of load until the load exceeds some maximum value. Possible reasons of such situation are problems with server hardware, for example, insufficient network bandwidth or low productivity of the server. 3. Sharp growth: If response time graph exhibits a sharp growth beginning from some level of user load while download time graph does not grow essentially, it means that the server provides a poor performance when the load reaches this level, or even cannot cope with such load. Users will see that the server responds very slowly, or does not respond at all. Graphs described in first two cases - flat or gradually growing - can suddenly exhibit a sharp growth. A point where the graph begins to grow sharply is called a performance breakpoint. After this breakpoint, server performance degrades noticeably. Note that you may use such interpretation of response time graph only if the download time graph does not exhibit an essential growth. If the percentage of download time from response time is rather high, it indicates that there are problems with the connection bandwidth, but not with server performance. Avg response time with page resources: Shows values of average response time for pages including page resources. Sessions per second: Shows the number of sessions executed per time unit (second, minute or hour). Time unit is specified in the Report Options. Pages per second: Shows the number of pages executed per time unit. Successful hits per second: Shows the number of hits executed without errors per time unit. The number of pages/hits per second is the most valuable result of testing a site/application capacity and overall performance. If you perform stress testing (testing the site under abnormal or extreme conditions), these graphs will help you find a performance breakpoint. Note that you can change the time unit (second, minute or hour) and click the Update report and graphs button in the Report Options. Current graphs will be updated using the new time unit. Active users: Shows the number of virtual users participated in the test. All: Displays all graphs on this tab. Data unit (KBytes/kbit, MBytes/Mbit or GBytes/Gbit) used on this tab is specified in the Report Options. Sending speed: Shows how many kbits per second were sent to the server. Receiving speed: Shows how many kbits per second were received from the server. Sending speed per user: Shows the sending speed per virtual user. Receiving speed per user: Shows the receiving speed per virtual user. These graphs will help you know whether the bandwidth of Internet connection to your server is sufficient to provide an acceptable level of performance or not. Note that you can change the data unit (KBytes/kbit, MBytes/Mbit or GBytes/Gbit) and click the Update report and graphs button in the Report Options. Current graphs will be updated using the new data unit. HTTP errors on pages, %: Shows the percentage of responses with HTTP errors from the total number of responses. Network errors on pages, %: Shows the percentage of responses with network errors from the total number of responses. Timeouts on pages, %: Shows the percentage of responses with timeouts from the total number of responses. Validation errors on pages, %: Shows the percentage of responses with validation errors from the total number of responses. HTTP errors on all hits, %: Shows the percentage of responses with HTTP errors from the total number of hits, including the errors of page resources. Network errors on all hits, %: Shows the percentage of responses with network errors from the total number of hits, including the errors of page resources. Timeouts on all hits, %: Shows the percentage of responses with timeouts from the total number of hits, including the errors of page resources. Validation errors on all hits, %: Shows the percentage of responses with validation errors from the total number of hits, including the errors of page resources. Total errors on all hits, %: Shows the percentage of all responses with errors from the total number of hits, including the errors of page resources. Total errors on pages, %: Shows the percentage of all responses with errors from the total number of responses. These graphs will help you know how error rate changes during a test when the number of virtual users is increasing. Error rate is the most valuable result of stress testing where you need to find the maximum number of users that can be served correctly, without errors. You will also need to watch error rate during reliability/endurance tests to verify that it is in acceptable range even after a long run. You can also view the Errors report for details. 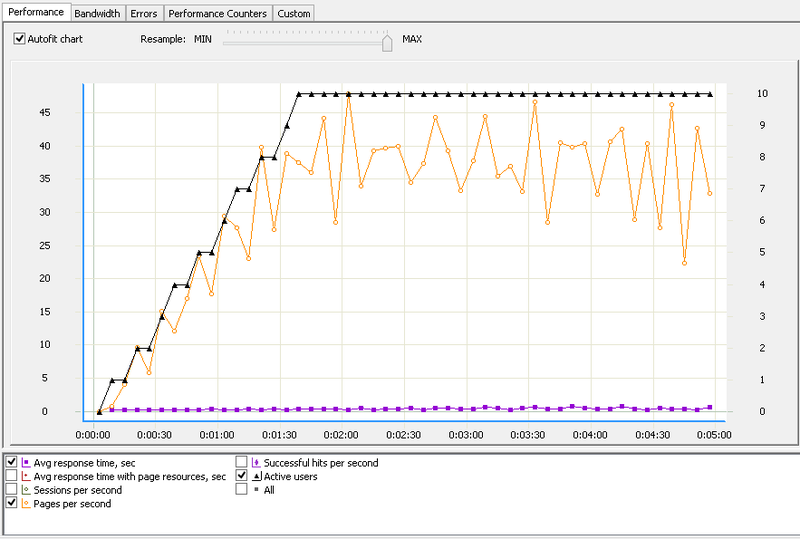 Graphs on this tab show values measured by performance counters for a web server or database server being tested. Custom tab represents all graphs from the previous tabs. You can save any chart as an image in png format in required location. Select a desired tab, right-click on the chart and select the Save Current Chart to Image... option on the context menu.